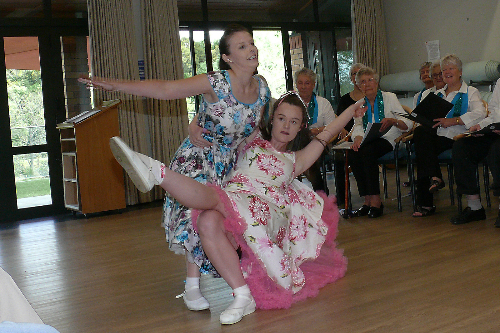 Last week a group of approx 20 students from Rototuna Senior High visited Alandale as part of their Community Project class, "Connecting with the Elderly'. The purpose of their visit was to engage with the 'Wizards' (an affectionate term the students used to describe the wise older generation). 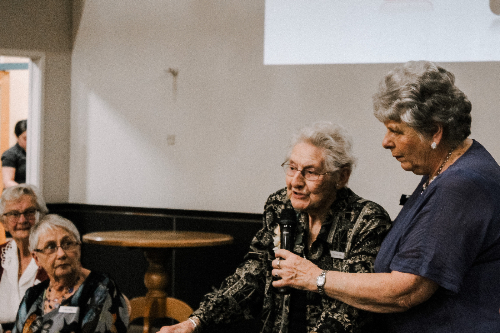 They wanted to learn about Alandale, what struggles the older generation face today, how they can help the elderly as a school community, etc. Students arrived bright and early to participate in Steph's Strong & Stable exercise class. This class proved to be bit of a challenge for the youthful students much to the surprise of students and residents alike. 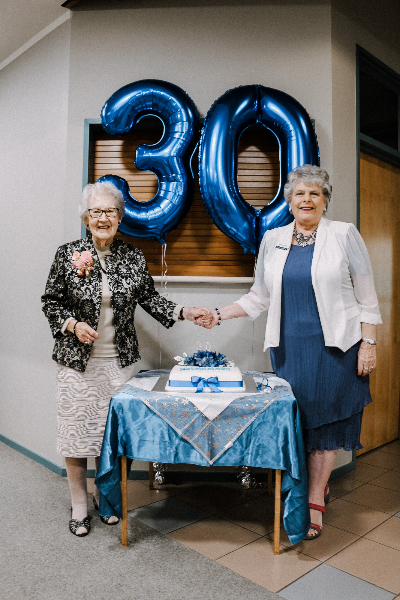 Next they joined the residents at Coffee Morning where they mixed and mingled, chatting away over the delicious spread of sweet and savoury food, tea and coffee. Then the students sat down with a few residents to talk a bit more, finishing their morning at Alandale with a tour of the complex and grounds. It was a wonderful morning which was enjoyed by all. 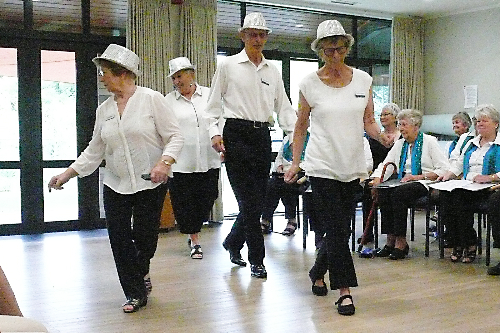 The residents were very impressed by the students and their attitudes. The students were equally impressed by the friendly 'Wizards' and Alandale, with one or two hoping to retire early to move in. 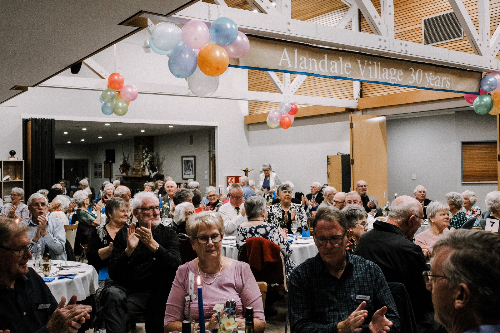 Alandale wins again at the Inter-Village Quiz! Congratulations to John, Bryan, Harley & Ross on your success. Time came for one of our longest residing residents to leave Alandale to be nearer to her family. Marie and her husband Doug were one of the first to purchase in Alandale and moved into the Village a short time later in January 1989. At a recent Residents' Meeting there was a special presentation to Marie by Brian Smith, Chairman of the Alandale Foundation Board. 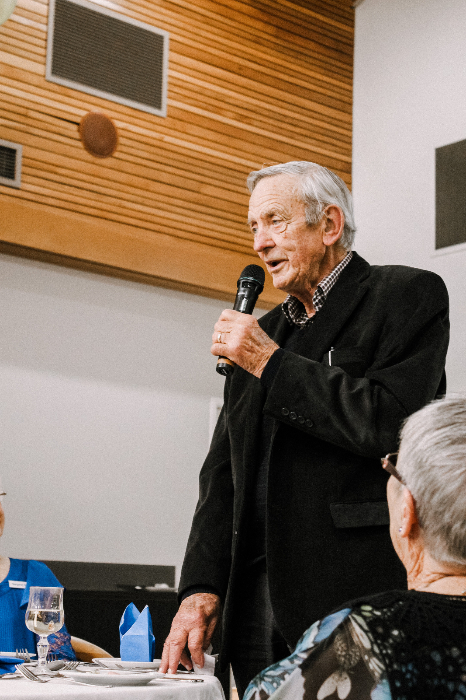 He paid tribute to Marie and thanked her for her outstanding contribution to Alandale over the years as she has served time on the Advisory Committee, the Board of Trustees, was the Convenor of the Mah Jong group for 30 years and was involved in many events along the way. On the day that Marie left the village, close to 60 plus residents and staff formed an 'Alandale Guard of Honour' on Alandale Ave. It was a wonderful showcase of the 'Alandale Spirit' and it was very special - a fitting farewell for someone so deserving. 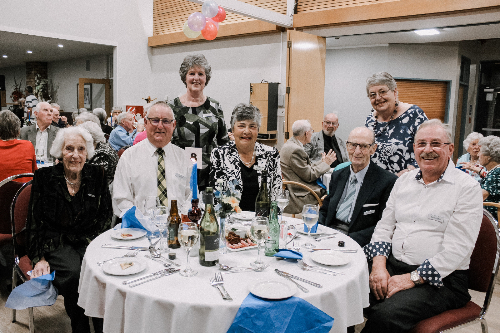 "Let's Ride Number 44 to Pukekohe"
Early January, the Tuesday Club Convenor, organised a trip for 25 Alandale residents to Pukekohe aboard the Number 44 Bus that departs from the Base. 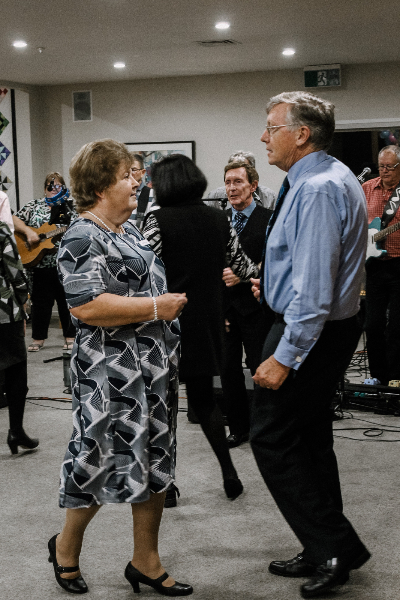 They departed at 9.30am and the bus made several stops in communities along the way to collect more passengers before they arrived in Pukekohe about lunchtime. Lunch was at the lovely Town Mouse Cafe which was a minute from the bus stop. At 2.30pm they all caught the bus back to Hamilton, stopping in Pokeno for a much anticipated ice-cream. Arriving back at Alandale in time for Happy Hour. Tucked away in a quiet corner of Alandale a sprinkle of Christmas Magic made Alandale light up! Christmas lights galore in the trees, on the villas and in Wynn's Way created a truly magical sight for all to see and marvel at. Congratulations to Philip & Lorna - your spectacular display brought so much joy to residents and their families, young and old. 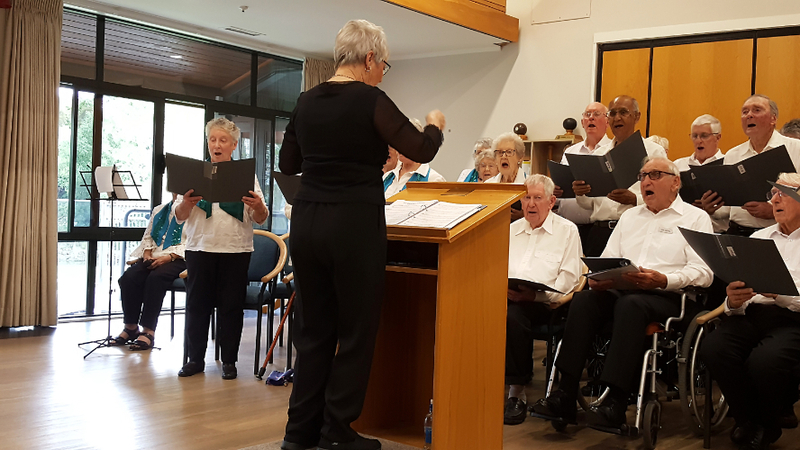 A group of approx 35 students from Waikato Diocesan for Girls, all Year 9 and 10 students, put on a end-of-year Christmas themed Musical Performance for the residents of Alandale. The performance was outstanding and these young ladies were extremely talented. Their voices were truly magnificent, even moving some of our residents to tears. 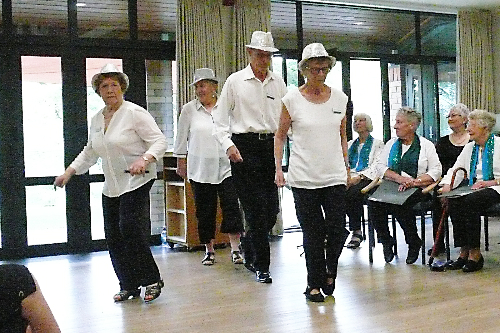 Many residents were singing along or toe tapping to the music. 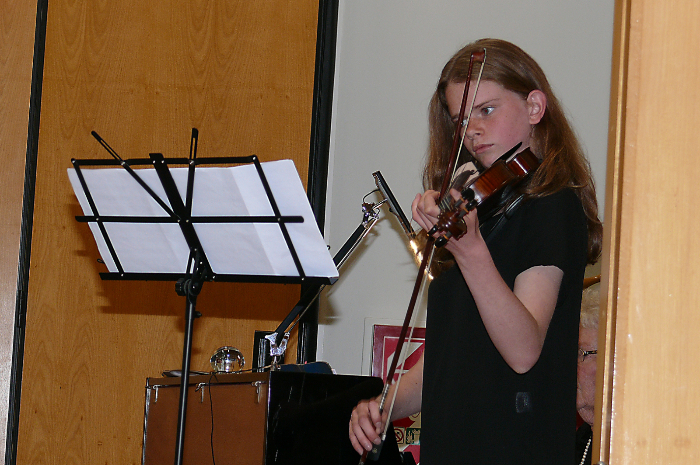 We were treated to performances from the Junior Band, the Guitar group, Barbershop group, a Dance group and Singers performed solos, duets and trios. A wonderful afternoon of outstanding entertainment! 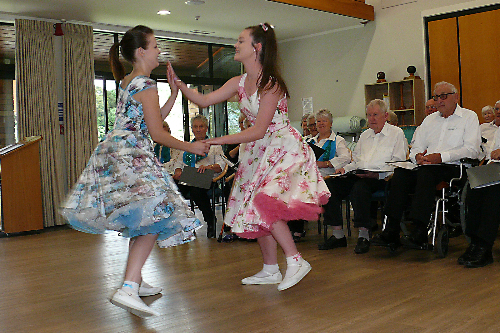 Residents gathered to celebrate Australia's most famous annual thoroughbred horse-race - the Melbourne Cup. The theme for the festivities was 'Just Plain Posh' so many turned up in their finest and got into the spirit of the day. Afternoon festivities included the 'toss the coin' for a bottle of Drambuie (which had been kindly donated), followed by nibbles and the Melbourne Cup broadcast on the big screen. A wonderful afternoon enjoyed by many. 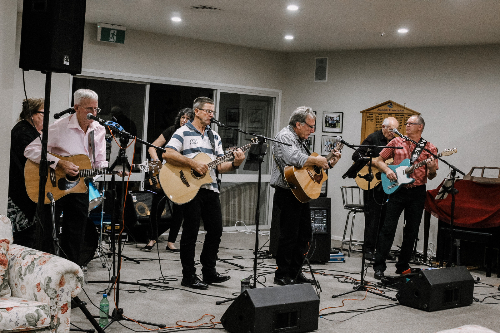 One Sunday afternoon, not too long ago, Alandale came alive with a magnificent Variety Concert, showcasing the talent of many residents and invited guests. 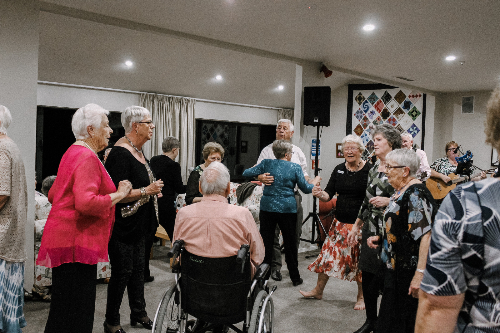 The Alandale Singers supported by a very talented violinist, a couple of Rock n Roll Dancers and an Alandale Line Dancing Group delighted the many residents, family and friends that were in attendance. 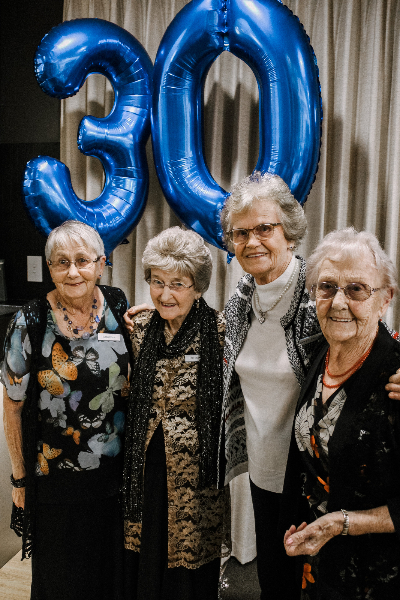 The Days for Girls sewing group were absolutely delighted to receive a cheque for $300 from the Frankton Rotary Club recently. This has enabled them to purchase material for making more hygiene kits. With another two day sewing session for Days for Girls coming up, this was perfect timing and very much appreciated. 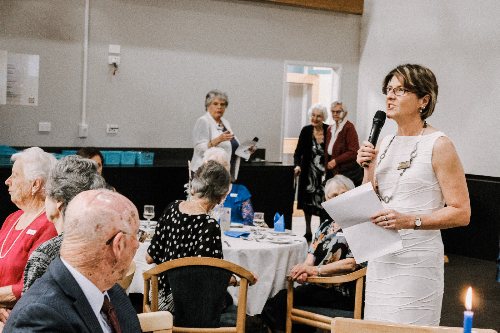 The Hamilton Inter Village Quiz is held about every four months. There are now six villages participating, each entering two teams of four people each. There are four sections each containing ten questions. Depending on the host village, these may have a particular slant. The very first one had a UK slant and the one before last was mainly about New Zealand. 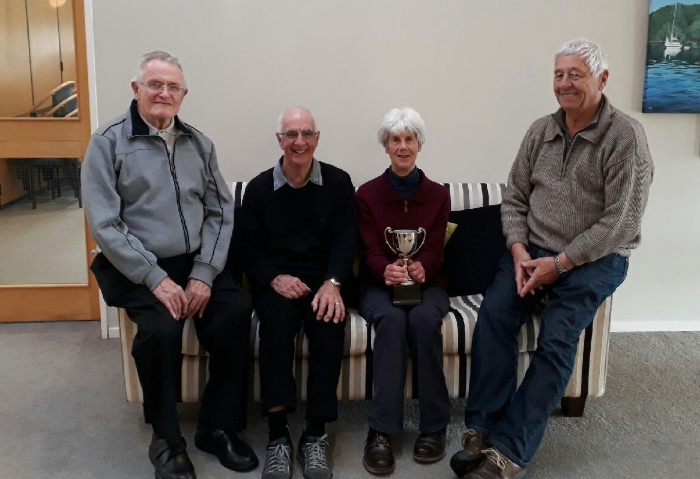 Recently the quiz was held at Tamahere and Alandale won the cup by a narrow margin. 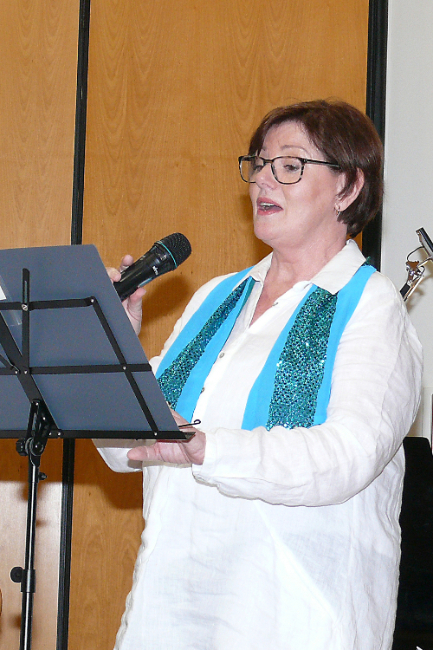 Recently the Alandale Singers joined forces with Horsham Downs Primary School Choir to present a 8-80 Concert. 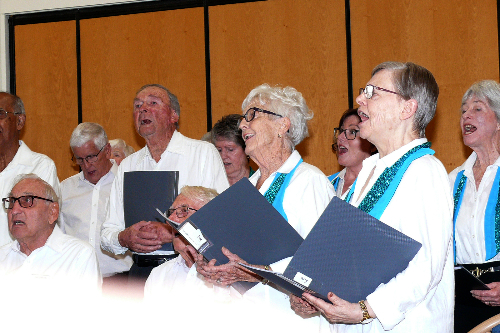 This marvellous concert of song voices, young and old, was enjoyed by the large crowed that attended. 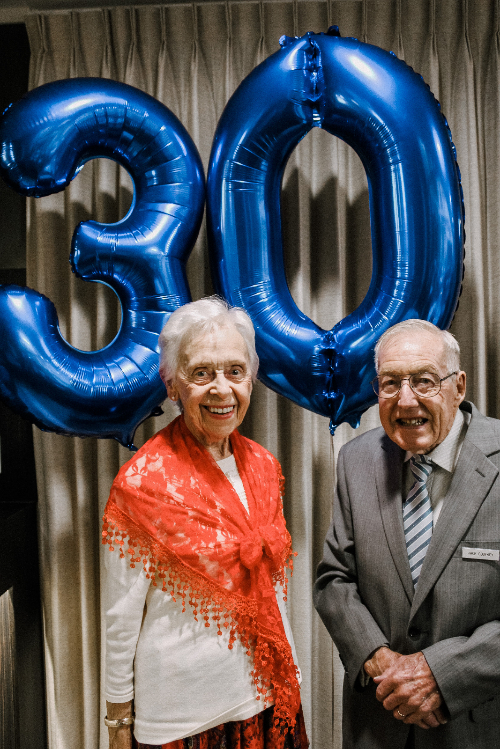 Residents recently celebrated Alandale's 30th anniversary with a celebratory dinner which included special guests, speeches, cake, dinner and band. Alandale wouldn't be what it is today without the vision of David Braithwaite. 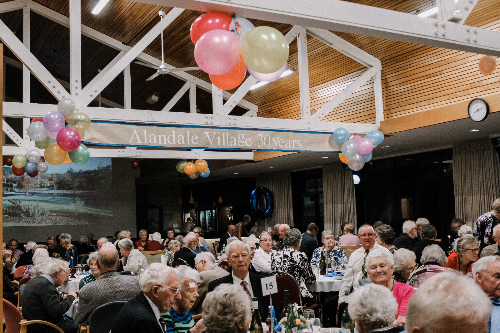 David spoke to the residents and guests about that vision and the early days of Alandale. 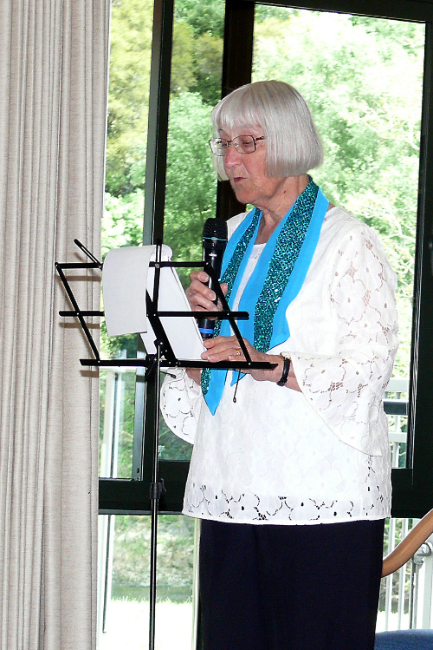 As one of Alandale's original residents, Paddy shared some fond memories and stories of her time here at Alandale. 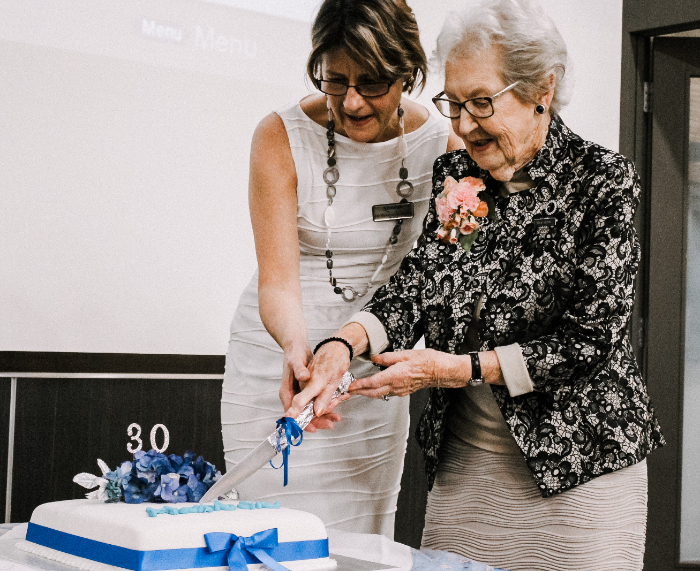 While Marie, another original resident, cut the birthday cake with Board member, Bronwyn Smits.